37411 'The Scottish Railway Preservation Society ' accelerating towards Ystrad Mynach signal box with the 2F38 15:15 Rhymney - Cardiff service. 2nd April 2005. 37042 arrives at Didcot with a rake of ex Yeoman box wagons, the working was not one that I had been expecting and took me somewhat by surprise. The photo was taken during May 2004. 37042 was stored just a few weeks later in June '04, although later reinstated for a short period for engineering duties in January 2005. 37405 passes through Bridge of Orchy with the 1Y11 Euston - Fort William sleeper on 31st May 2006 just over a week before the end of booked class 37 haulage on the West Highland line. 37423 heads over the River Avon at Evesham Marina hauling saloon 'Caroline' as 2Z02 08:51 Paddington - Bristol. 01/07/08. On Sunday 19th March 2006 37670 - still carrying its 'St Blazey T&RS Depot' nameplates and 37669 hauled a Craven Arms - Newport empty ballast which ran as 6W32. Both loco's were only taken out of store just days earlier in the of case of 669 only the day before. The loco's were paired up for their first outing since reinstatement for the outward journey and the return is seen here at Hereford running later than expected in a lucky spot of sunshine. 37416 passes Lea Marston with the 6G42 Birch Coppice - Bescot Enterprise feeder. The service conveyed car parts from the distribution centre at Birch Coppice. Class 37's were once a regular performer on this working until early 2005 when haulage went over to class 67's. However on 27th October 37416 was allocated to the working, the weather was perfect so a quick call to work explaining that I was tucked up in bed with some imaginary illness was made and a mad dash to Lea Marston followed. On 29th April 2006 Kingfisher Tours ran the 'Whitby Jet' railtour from Rugby to Whitby using 37419 and 37425. The shot carried extra significance as 37419 had been pre-assigned for storage the following Tuesday. After numerous 'full dull' shots of the outbound leg taken on the Esk Valley Line the return from Whitby is photographed here at Battersby in the afternoon sunshine. Another shot of the 'Whitby Jet' taken 15 minutes later as 37425 heads the tour out of Battersby with 37419 tailing. 37417 hauls the 6Z79 Northampton - Bescot scrap into Bescot, 66089 which had failed at Northampton was attached to the rear. I had originally gone to Cathiron for this working, however it ran nearly an hour earlier than planned which meant the sun hadn't quite come round enough so a dash to Bescot was made to grab this. 1st July 2006. 37601 has just ran round its train at Melton Mowbray and after a short wait in the loop the driver has just opened her up to head the few remaining miles to its destination of Old Dalby. The working conveying brand new 345 019 was running as 5Q59 08:31 Wembley Yard No 1 Road - Old Dalby. 26th Feb 2018. 37401 passes Blakedown with 5Z37 Crewe - Kidderminster SVR with 6201 'Princess Elizabeth' and support coach in tow on 9th June 2008. 37405 passes through Hatton on 25th July 2006 with the late running 7V26 Bescot - Hinksey Yard spoil working, conveying around 30 loaded wagons. The train was running over an hour late at this stage which worked in my favour as the M40 was a little more busy than usual. The locomotive had been spruced up with silver buffers for railtour duties the previous weekend. During early summer in 2006 DRS hired two of its class 66's out to Freigtliner who were experiencing a motive power shortage. As a result of this DRS' 4L46 Ditton - Purfleet intermodal working was taken over by class 37's. The service is pictured here at Heamies Farm, Staffordshire on 9th June 2006. The train was running late at this stage and 37608 & 37218 where hammering along the fast line at speed to make up time. Class 37 haulage continued for some weeks on this turn until DRS cancelled the service due to poor loadings, evident in this illustration with only two containers in the consist. 37602 & 20317 take a break on the 6M67 Bridgewater - Crewe flasks. The consist was stopped at Worcester Shrub Hill for a number of hours as the yard had a back log of three freights to dispatch. 29th June 2006. 37069 & 37608 pass over the river Avon at Eckington 25/01/07 with 6M56 Berkley - Crewe flasks... or flask in this case. DRS' 37608 is seen here again, this time at Retford on the East Coast Mainline hauling a Network Rail Stoneblower on 5th April 2006. The 37 had traveled light loco to Marshgate to collect the short consist and returned as 6ZO5 Marshgate - Broxbourne. 37406 passes through Water Orton on 2nd November 2006 with the 6G36 Bescot - Birch Coppice trip working. The train train was running well behind time when it appeared at 10:33. Some high level cloud had just started to bubble up when the sound of 406 became audible, unfortunately it just took the edge off the light. The returning trip 6G42 Birch Coppice - Bescot is pictured here at Whitacre Junction at 11:44. The light here was perfect, but for some shadows which would have been less pronounced had the trees lost their leaves. 37417 heads through Lea Marston on 17th Oct 2007 with 6G42 Birch Coppice - Bescot. 37698 pauses for a crew change at Hereford during May 2004. The train is the 6M75 ADJ - Warrington and was worked by 698 twice during this week. Class 37's were regular performers on this working during 2004 and as a result a crowd of photographers could usually be seen at Hereford station where the train would recess for anything up to 45 minutes. 37259 top & tails with 37069 on 1Q18 Derby RTC - Derby RTC test train passes though Wellingborough en route to the capital on 8th April 2010. 37406 'The Saltire Society' stands at Edinburgh on 22nd May 2006 awaiting departure with the 1B01 Edinburgh - Fort William sleeper. The picture was taken at 04:18Hrs after a long run up from Crewe behind 90020. The following morning 37406 is pictured again at Edinburgh with the return at 00:55Hrs. The shot was taken shortly after 406 had shunted the Fort William portion of the Caledonian Sleeper onto the Inverness section on 23rd May 2006. Another station shot of the 'beds' this time with 37405 basking in the sunshine at Fort William on 30th May 2006. 37602 & 37069 1Z44 06:49 Crewe - Weymouth 'Wessexman'. Banbury. 23/05/09. 37408 'Loch Rannoch' accelerates away from Ystrad Mynach station with the 2F34 14:15 Rhymney - Cardiff service on April 2nd 2005. The only full sun shot I have of 408 before its demise due to an accident in the valleys. The 10th December 2005 was the day that Arriva had advertised as being the last day of loco haulage on the Rhymney circuit and apart from a few night shots this was the full sun shot of the day - 37411 'Caerphilly Castle' with the 2F26 12:15 Rhymney - Cardiff at Pontlottyn. 37099 in its guise as 37324 passes Hailes on the Gloucestershire & Warwickshire Railway with a Toddington - Cheltenham Racecourse working during the spring diesel gala on 1st April 2006. Never would have imagined back then that 099 would be fresh from overhaul and back earning its crust on the mainline in 2016. Pristine looking 37676 and not so pristine looking 37248 approach Bescot Stadium with 5Z47 08:00 Carnforth - Poole ECS for the following days Spitfire tour on 28/11/08. Shortly after heavy rain had moved south 37417 & 37401 pass through Defford with Compass Tours' 'Heart of Wales Explorer' on the return leg running as 1Z71 16:05 Cardiff - Blackburn. 12/04/08. 37422 in poor light at Norton Junction with 6M17 Long Marston - Bescot on 25th July 2008. 37612 & 37604 at Eckington with 6Z67 Bridgewater - Crewe flasks. 06/01/09. 37401 ‘Mary Queen of Scots’ heads through Nethertown with 2C41 14:37 Barrow - Carlisle on 29th August 2016. 37606 & 37605 pass through Croome on 21st October 2007 with a Derby RTC - Bristol test train. 37608 & 37611 on 1Z94 15:00 Swansea - Derby NMT replacement Abbotswood 08/09/06. 37401 & 37670 with Pathfinder's 'The West Highlander' tour 1Z17 10:15 Fort William - Oban at Spean Bridge. 12/04/09. 37401 & 37670 with Pathfinder's 'The West Highlander' tour 1Z17 10:15 Fort William - Oban at Achallader. 12/04/09. 37670 & 37401 1Z18 Oban - Fort William at Loch Awe. 12/04/09. 37670 heads 6K66 09:10 Fort William - Mallaig ballast at Kinloid. The train was dropping ballast when the shot was taken. 13/04/09. Looking the other way for the return, 37670 6K66 13:40 Mallaig - Fort William - Kinloid. 13/04/09. 37670 6K66 13:40 Mallaig - Fort William - Arisaig. 13/04/09. 37423 - 2Z44 10:58 Derby RTC - Southampton. Clay Mills. 22/04/09. 37087 & 37688 6K41 14:58 Valley - Crewe. Valley. 23/06/09. 37609 tnt with 37059 1Q14 09:36 Derby RTC - Derby RTC at Wetmore Farm. 10/09/09. 37603 & 37601 6M67 13:41 Berkeley - Crewe flask. Ryecroft Junction. 22/07/09. 37602 - 37218 1Z12 09:33 Bristol Temple Meads - Derby RTC. Defford. 21/08/09. 37069 top & tails with 37259 on 1Q18 Derby RTC - Derby RTC test train heading back to Derby through Wellingborough having visited St Pancras on 8th April 2010. 37510 & 37667 6Z90 08:37 Tyne Dock - Sheerness scrap metal. Cossington. 21/04/10. As this train was looped a quick fast car south to Thurmaston produced this shot. 37510 & 37667 6Z90 08:37 Tyne Dock - Sheerness scrap metal. Thurmaston. 21/04/10. 37667 & 37510 return up the Midland Mainline with 6Z70 Sheerness - Stockton empty scrap seen at Kangaroo Spinney, Wellingborough. 23/04/10. 97302 (37170) passes Catholm with 5Z97 10:10 Derby RTC - Tyseley on 18th May 2010. 37218 + 37259 5Z82 11:24 Carnforth - Gloucester tour ECS. Spetchley 25/06/10. Heavyweight 37706 powers through Banbury with 5z84 03:00 Carnforth - Southall stock move on 17th June 2010. 37194 & 37667 await departure from Berekley on 20th June 2010 with 6m56 13:41 Berekley - Crewe flask. 37194 & 37667 head through Coaley on 20th June 2010 with 6m56 13:41 Berekley - Crewe flask. 37405 heads 2F34 14:15 Rhymney - Cardiff through Bargoed on 8th December 2005. 37038 and 37259 pass Norton in Worcestershire with 6M67 Bridgewater - Crewe Nuclear Flask on 02/09/10. 37229 'Jonty Jarvis' & 37603 power a late running 6V73 04:15 Crewe CLS to Berkeley flask through Abbotswood at 07:49 on 30/08/10. The train was routed via Shrub Hill on this morning and as a result has just joined the Birmingham - Bristol line at Abbotswood Junction, although only hauling one FNA the 37's were powering away from the junction hard at this stage, the train was audible for some time before its appearance. 37611 and 37607 top n tail a test coach through Spetchley in Worcestershire on 12/09/10. The working ran as 1Q12 08:55 Derby RTC - Bristol Temple Meads and was running 20 minutes early at this point. 37603 & 37604 head a rake of ex Fastline hoppers out of the former MoD base at Long Marston on 7th October 2010. The train was booked out as 4Z81 11:00 Long Marston - Carlisle and is seen here leaving the gates some 20 minutes early. 37603 & 37604 are seen slowly negotiating the MoD branch from Long Marston to the main line connection at Honeybourne on 7th October 2010. The location of the shot is the foot crossing at Broad Marston. The train was running as 4Z81 11:00 Long Marston - Carlisle and was running 20 early at this point. 37604 & 37603 pass through Lower Moor with 6Z80 11:10 Long Marston - Sheerness with wagons for a new flow to Blackburn on 11/10/10. 37610 & 37423 pass over the Avon at Eckington with 6M56 Berkeley - Crewe flask on 25/10/10. 97302 (37170) and 97304 (37217) pass through Lower Moor on the Cotswold line forming 1Q12 13:43 Long Marston to Derby RTC on 27th October 2010. 37682 & 20308 head 6M67 Bridgewater - Crewe flasks over the Avon at Eckington on 27th October 2010. 97304 (37217) and 97302 (37170) pass the site of Fladbury station on the Cotswold line forming 1Q12 07:47 Derby RTC - Long Marston on 25/10/10. 97304 (37217) and 97302 (37170) pass through Aldington on the Cotswold line forming 1Q12 07:47 Derby RTC - Long Marston on 25/10/10. 37682 & 37229 head 6M67 Bridgewater - Crewe flask through Croome 12/04/11. 37059 heads 1Q13 09:35 Tyseley - Tyseley via the Cotswold Line to Oxford North Junction. The train is seen passing Shorthampton between Ascott-under-Wychwood and Charlbury. This section of line is due to be re doubled imminently with new sleepers ready to be dropped into place already on site and the new line being visible in the background. 12/04/11. 37069 top and tails with 37059 1Q13 09:35 Tyseley - Tyseley via the Cotswold Line to Oxford North Junction. The train is seen at Blackminster Nr Evesham. With the new sleepers in place awaiting rail for the Cotswold Line redoubling the 37's are running on what will soon be the down line. 12/04/11. 37069 top and tails with 37059 1Q13 09:35 Tyseley - Tyseley via the Cotswold Line to Oxford North Junction. Lower Moor. 12/04/11. 97302 (37170) passes through Lower Upton on 22nd June 2011 with 6Z97 14:30 Bescot Up Engineers Sidings - Coton Hil. 37601 'Class 37 -Fifty' partners 37218 through Norton in Worcestershire with 6M67 Bridgewater - Crewe Nuclear Flask on 23/06/11. 37510 & 37423 head 6V73 04:15 Crewe CLS to Berkeley flask through Eckington on 3rd June 2011. 37601 'Class 37 -Fifty' heads 2Q88 05:35 Derby RTC - Swansea Maliphant CS with 37038 on the rear through Croome 27th June 2011. 37607 & 37608 head 1Z59 05:45 Glasgow Central to Southampton Eastern Docks 'CruiseSaver Express' through South Moreton on 02/09/11. 47841 was attached to the rear. The group of 10 to 15 photographers gathered on the bridge all expected this to be routed on the slow, just before the train came into view word arrived that it was being put on the fast, so half the group, including myself had to quickly change position. Note the dead pigeon hanging out of 37607's multiple working socket. 37218 & 37601 'Class 37 -Fifty' head through Croome in Worcestershire with 6V73 04:33 Crewe - Berkeley flask. The train was running in the region of 90 minutes late at this point, passing the gallery at 08:31 and allowing for a shadow free photograph to be obtained at Croome which even at the height of summer is near impossible to obtain due to high trees to the right of the frame coupled with the fact that the working can often pass though earlier than its booked time of 07:02. 37611 & 37601 top and tail 1Q13 Didcot - Didcot Survey Train through Cholsey on 29/09/11. 37603 leads 47841 & 47802 through Lichfield Trent Valley with ECS from the previous days 'Boat Train' running as 5Z61 09:41 Eastleigh TRSMD - Crewe HS. 28/09/11. On hire to DBS 37601 & 37611 shatter the peace at Hinksey as they double head 6A48 Bicester - Didcot MoD. 13/10/11. Following a its recent release back into traffic after overhaul this was my first opportunity to photograph 37261. It is seen climbing the gradient at Old Milverton on the single line from Coventry to Leamington Spa in charge of 1Q13 13:40 Derby RTC - Old Oak Common TMD on Sunday 25th March 2012, Network Rails 97301 was on the rear. 37261 is seen passing through Stoke Edith with 1Q13 07:33 1Q13 Tyseley - Tyseley via Hereford on route back from Hereford on 27/03/12. 37261 is seen passing through Bradlow Coppice with 1Q13 07:33 1Q13 Tyseley - Old Oak Commom via Hereford on 28/03/12. 97301 top n tails with 37261 on 1Q13 07:33 1Q13 Tyseley - Tyseley via Hereford at Malvern on 27/03/12. 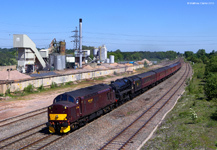 97302 heads off the Sutton Park line at Ryecroft Junction with 7G22 Washwood Heath - Bescot on 22/05/12. 37682 stands at York with 3Q03 Heaton - Derby test train on 8th June 2012. 37607 & 37409 head through Blakedown with 1Z30 Exeter - Hexham on 29/03/13. 37608 and 20303 head 6V73 04:33 Crewe - Berkeley flask through Croome on 08/07/13. 37667 - 3Z18 Derby RTC to Bristol Kingsland Road. Norton, Worcestershire. 16/07/13.